The Eclectic Screening Room: The Restoration of "Deluge"
To learn more about this movie, and its restoration, below is the news release, pasted from Kino Lorber's Facebook page. 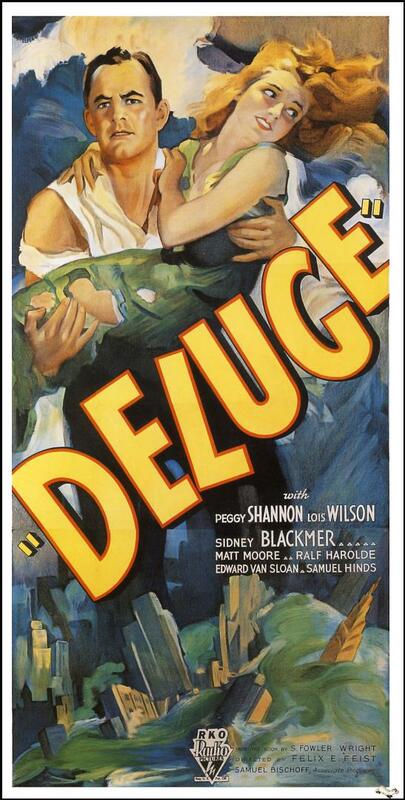 A Brand New 2K Restoration of the 1933 Disaster Film “DELUGE” Acquired For U.S. Release! Kino Lorber announces the acquisition of Felix E. Feist’s extraordinary 1933 disaster film DELUGE, restored by Lobster Films, Paris. Triggered by a series of earthquakes on the West Coast of the United States, a massive tidal wave circles the globe and—in a prolonged and spectacular special effects sequence—wipes out New York City. Sidney Blackmer stars as a man who, separated from his family, must begin to rebuild civilization in the wake of the catastrophe. For decades, DELUGE was a lost film of almost mythical status, until horror/sci-fi archivist Forrest J. Ackerman discovered an Italian-dubbed print in 1981. Viewing this poor-quality print was an arduous experience and was only a dim substitute for the original film. But all this changed in 2016 when Lobster Films unearthed a 35mm nitrate negative with the original English soundtrack. The restored DELUGE will premiere at L’Étrange Festival in Paris on September 18, 2016. The film will be given a limited U.S. theatrical release by KINO REPERTORY, followed by a KL Studio Classics Blu-ray and DVD release.